Although it is possible to install a programmable thermostat that works properly by yourself, it is not likely. With boiler and heat pumps especially, it is easy to buy and install the wrong type of thermostat. You can save a lot of money on your heating bill by switching to a programmable thermostat, but all those savings could go to waste if you try to DIY the project. Newer thermostats, like the Nest Learning Thermostat, Honeywell Lyric, and Ecobee3, can drastically reduce your heating bill. In addition to cutting utility bills, programmable thermostats also extend the life of your HVAC system by only using it when YOU need it. Why would you be heating your home at a constant temperature if you are not there, or asleep? For maximum savings, have a professional install or replace a programmable thermostat in your home. And remember, in order to reap the benefits, you must remember to actually "program" it. If you are looking for a new, "smart" thermostat for your home, take a look at this side-by-side comparison of the new 2015 smart thermostats. Gold Medal Service is a certified installer for all thermostat makes and models. Ensure that your energy-saving thermostat is working properly all year round with professional thermostat installation in your New Jersey home. Although many people think that cranking up their thermostat will heat their home faster, that doesn't mean it is true. In fact, not only is this advice factually incorrect, it could also result in many unwanted problems. No matter what temperature you set your thermostat to, your heater will pump out the same amount of heat as always. The thermostat setting merely lets your heater know when the home has reached the desired temperature and then it shuts off. The problem with cranking up the thermostat is that it does nothing to heat your home faster and many people forget to reset it back to its normal setting, resulting in an overheated home, higher utility bills, and unnecessary HVAC operation. 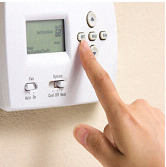 The smarter way to enjoy optimum heat and comfort is to install a programmable thermostat. Nobody likes pungent odors in their home, but masking them with sprays and candles is not a good idea. Some odors, like a rotten egg smell, can indicate that you have a gas leak somewhere in the house. Other smells, like mold or must, indicate that you have ventilation and moisture problems. During winter months especially, indoor air quality becomes a real issue. Dirty and leaking air ducts, combined with dirty air filters create an indoor health hazard. "By using Aeroseal technology, Gold Medal Service can ensure that all the duct work is sealed properly, improving air quality throughout the home." Make sure you are checking and/or replacing your air filters every month, but if there is still a lingering smell, have a professional air quality inspector diagnose the problem and help you get rid of the source. There are many ways that you can help combat indoor air quality issues in the home, which the EPA estimates to be up to 5 times as polluted as outdoor air. Check out our blog for 15 Ways to Improve Indoor Air Quality. When the sun is out, make sure to take advantage of the sunlight and open your shades. When you leave for work in the morning, open all of your shades, but also keep valuable possessions out of line of sight from the outside, like laptops, tablets, phones, TVs, and jewelry. The temptation may be too great for some to pass up. To ensure maximum heat transfer, routinely clean your windows. Dust and grime will block or filter out the sun's rays. Also, consider investing in heavy drapes if you don't have them already. Keep them closed when the sun is hidden. These drapes are often advertised as "thermal" curtains or drapes.You can look at some here. Not only will annual heating tune-ups provide you with maximum efficiency, but it will also ensure that your HVAC warranty remains valid. Neglecting to schedule annual HVAC maintenance or sign up for a maintenance plan will void most HVAC warranty claims. Another way that you can void your warranty is by failing to register it. Many HVAC warranties require you to register your new system online or by mail. If you choose a licensed and qualified installer to install your new HVAC system, they will usually walk you through the process and even register the product for you. Keep your proof of maintenance just in case. Doing these two things as well as signing up for an annual HVAC maintenance plan will ensure that your warranty remains valid for however long the coverage lasts. If you have further questions about home heating mistakes, how to save money on heating bills, or general home safety and efficiency, we’ll be glad to answer any of your questions!